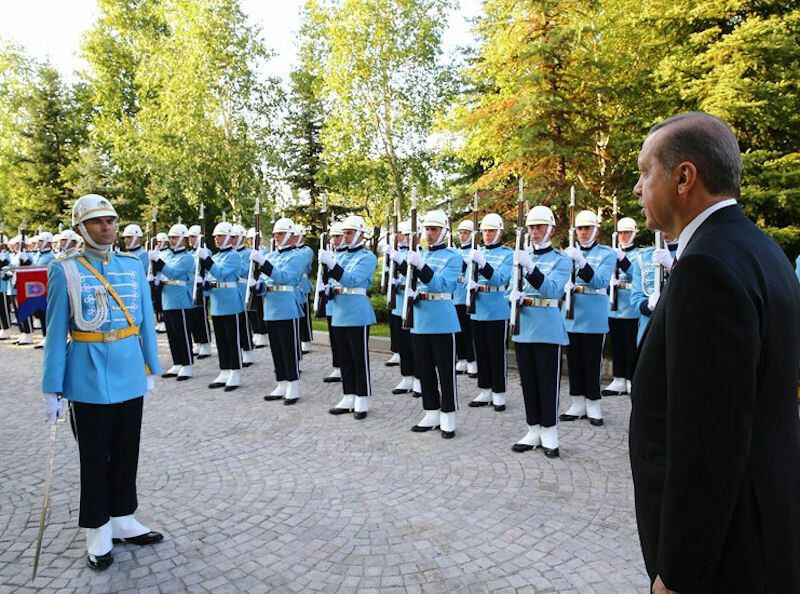 The Presidential Guard Regiment (Turkish: Cumhurbaskanligi Muhafiz Alayi) is a military unit of about 2,500 soldiers responsible for Presidential protection and honor guard cermonial duties. It was stationed in Çankaya Köskü, the official residence of the Prime Minister of Turkey, which was until 2014 the official residence of the President of Turkey. 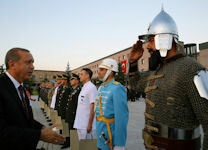 They Guard wear turquoise and white ceremonial uniforms, unlike the rest of the Land Forces of the Turkish Armed Forces. Ataturk's Guard Regiment was formed to provide security on 18 July 1920, with Colonel Topal Osman as the founding commander. In the year 1920 the situation in, Anatolia was quite challenging. Ankara in those years was a lone city in the middle of Anatolia. There was anxiety about being able to maintain the presence of the Turkish state, and the security issue in Anatolia was fierce. The population of Ankara in 1920 was small enough to fit in the International Stadium. Kemal Atatürk said "I just did not assume a duty to just protect the Parliament". The Assembly, in line with the needs, formed a battalion of the National Guard on 18 July 1920, with first lieutenant Ismail As Tanui as commander, establishing 9 squads with 80 soldiers. The unit fought at the second battle of Inönü and Sakarya. The Battalion, during the Turkish war, lost 7 officers and 15 soldiers, giving martyr's name in gold letters. 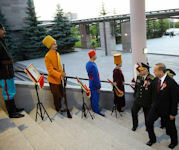 At first, the Parliament and the ceremony Guard Battalion were connected, but in 1927 some 2,500 troops were formed into the Presidential Guards Regiment. In addition, the Parliament and the ceremony Guards Battalion began to act according to the union. At the time of Word War II the State Council stressed that the National Guard Regiment of be restructured for "preparations of Turkey to enter the war". It was brought to the brigade level, and the regiment took its name 64 Brigade in September 1939. On 9 May 1940 the division level was removed and deployed in Catalca. These divisions, Istanbul and 4th Army Corps Command was assigned command. After the Second World War, the division was abolished in 1948. At that time, the company was left attached to the division in Ankara. The company restructured and again later restructured to the battalion level. On May 16, 1953 the present name was given - the Presidential Guard Regiment - which served until today. Parliamentary Guard Battalion in 1953 was configured began to serve under the Presidential Guard regiment. Some sources report this unit as subordinate to the Army Staff, while others report that it was subordinate to the 2nd Army's Fourth Corps. Parliament Guards Battalion and ceremonial unit existed from 18 July 1920 to 21 December 2011 attached to the Grand National Assembly of Turkey. On 21 December 2011 the battalion was disbanded and the soldiers in the battalion were sent to the Presidential Guard Regiment. On the same day the police took over the security of the parliament, and took over the security of the Presidential Guard Regiment's attached to a battalion. On May 27, 1960, Turkish army units, under the direction of the chief of General Staff, Cemal Gürsel, seized the principal government buildings and communications centers and arrested President Bayar, Prime Minister Menderes, and most of the DP representatives in the Grand National Assembly, as well as a large number of other public officials. Those arrested were charged with abrogating the constitution and instituting a dictatorship. The coup was accomplished with little violence and was accepted quickly throughout the country. In 1961 a military coup attempt failed, for a number of reasons, not least of which was the failure to capture the government. On the afternoon of 22 February 1961 the Council of Ministers and the President were meeting in the President's residence. They could have easily been held there by the Presidential Guard, if that unit had rallied to the coup. But the major commanding the mounted troop was loyal to the government, which sheltered with the Air Force, which supported the government. President Recep Tayyip Erdogan visited the Presidential Guard Regiment Command 06 Novemer 2014, offered asure (Noah’s pudding) to the soldiers on the occasion of Muharram and ate asure with them. Moreover, asure was distributed at different points in Ankara and Istanbul under the auspices of Social Services Directorate of the Presidency. President Erdogan attended a ceremony 08 July 2015 to mark the 95th anniversary of the foundation of the Presidential Guard Regiment during which a handover ceremony was also held. 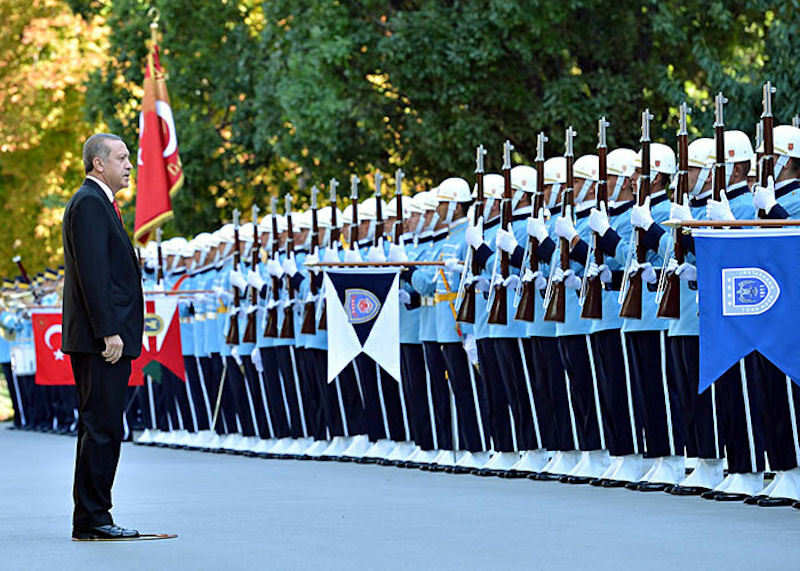 Parliament Speaker Ismet Yilmaz, Prime Minister Ahmet Davutoglu, Minister of National Defense Vecdi Gönül, Chief of General Staff Full General Necdet Özel and Commanders-in-Chief were also present at the ceremony held at the Presidential Guard Regiment Command. When Erdogan opened a $500 million, 1,000-room presidential palace in October 2014, critics compared the grandiose Ankara residence to one being built by former Romanian communist dictator Nicolae Ceausescu on the eve of his downfall. 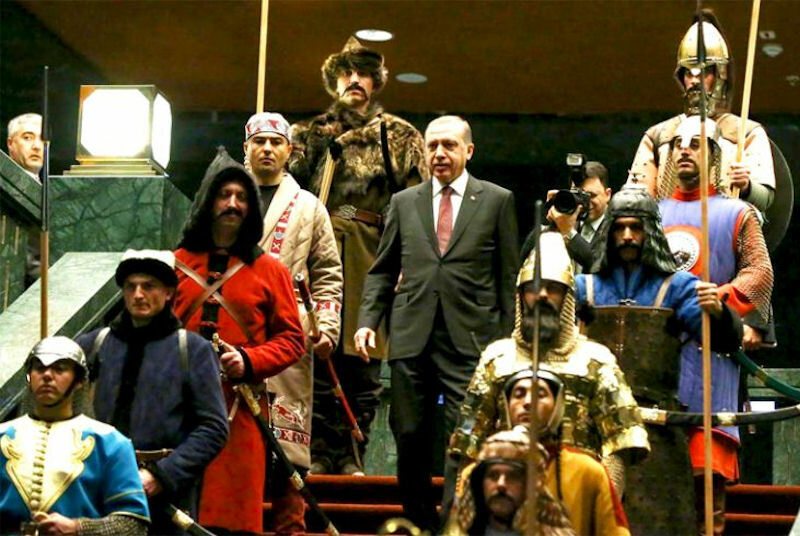 Commentators asked why Turkish presidents would need such an opulent palace when the office is largely ceremonial, restricted to approving legislation. Subsequently, the answer became increasingly clear. Since switching from the premiership with his August 2014 election to the presidency, Erdogan began grabbing more powers for himself and forming what opposition commentators claim is a "shadow government." It's part of an effort, they say, to reclaim power over ministers and the country’s parliament that he'd lost when he left the prime minister's office. He'd been prime minister since 2003. Using a confidential decree to sidestep the 1982 constitution, Erdogan increased the presidential staff dramatically, boosting the number of directorates from four to 13. New directorates include ones to oversee internal security, foreign relations, economy, defense, energy and investment. 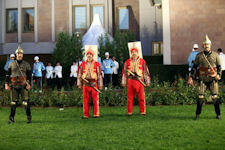 Prime Minister Recep Tayyip Erdogan and his wife Emine Erdogan hosted a 30 August 2014 Victory Day reception at the Çankaya Presidential Palace, the first time they had doene so. The reception was attended by State officials as well as many guests from different parts of society. In the reception area, Guard staff officers with the regiment, drew attention to the uniforms worn by the petty officers and sergeants. 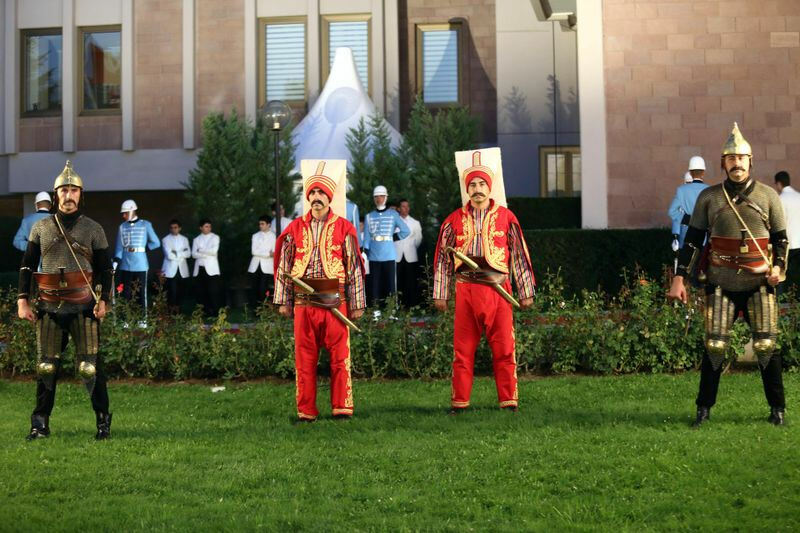 Soldiers were dressed in uniforms used by the Ottoman Turkish army, including 21 different uniforms specially prepared in accordance with the choreography for the night. 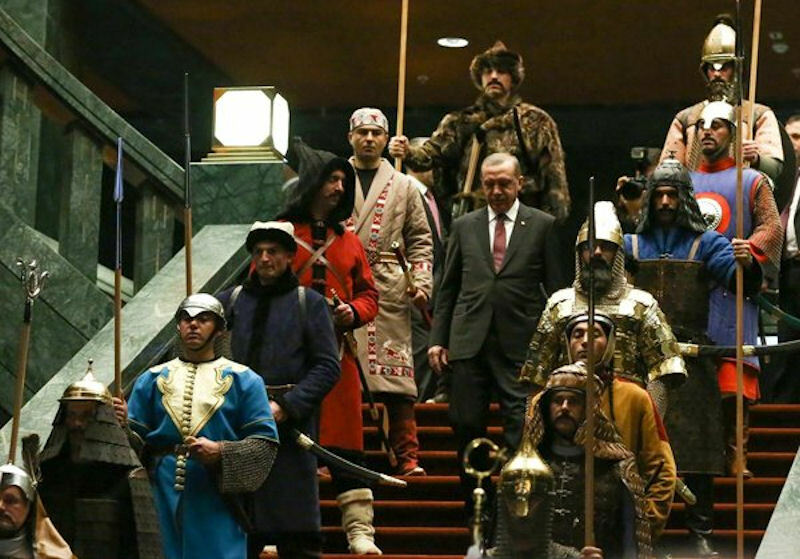 In January 2015, President Ergogan greeted distinguished vistors flanked by warriors in full regalia from each of the 16 Turkish empires. 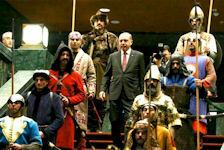 As Mahmoud Abbas, the Palestinian president, shook hands with Erdogan, the main staircase of the Turkish leader’s controversial new presidential palace was occupied by 16 warriors dressed in historical armour, carrying spears, brandishing shields and clutching fearsome-looking swords. These range from the great Hunnic empire founded around 200 BC though to the Seljuk empire, the Mughal empire, and right up to the Ottoman empire that was dissolved in the 1920s with the foundation of the modern Turkish republic. Upon arrival at the Presidential Palace, a new Ambassador is met by an A.D.C. of the President. After shaking hands with the A.D.C. who will be introduced by the Protocol Officer, the Ambassador proceeds towards the point which has been marked on the main staircase, together with the A.D.C. on his/her right and the Protocol Officer on his/her left. They stop at this point and the National Anthems of the country represented by the Ambassador and of Turkey are played by the Band of the Presidential Guard Regiment. The Ambassador then proceeds to the Band which is on the right side of the Guard of Honour and from thereon advances slowly to inspect the Guard of Honour. During the inspection, while the Guard of Honour is on the left and the A.D.C. on the right, the Protocol Officer follows the Ambassador one step behind on his/her left. At the termination of the inspection, the Ambassador turns back to enter the building and before climbing up the stairs, stops at the marked point and turns to salute the Guard of Honour in the following words in Turkish: "Merhaba Asker"'(Salute Soldier) to which the Guards will reciprocate: "Sagol" (Thanks). The staff of the Embassy observes the ceremony from the spot reserved for them. Then the Chief of Protocol enters the Reception Hall and announces to the President the arrival of the Ambassador. In the Reception Hall, one step behind the President, the Minister/Undersecretary or the Deputy Undersecretary of Foreign Affairs takes his/her place on the right, the Chief of Cabinet of the President on the left and the Chief A.D.C. at the center. An Adviser, the Commander of the Presidential Guard Regiment and an A.D.C. take their places on the right side of the Hall and the Chief of Protocol at the entrance. The Ambassador presents to the President his/her Letters of Credence and the Letters of Recall of his/her predecessor (if not yet presented). A funeral was held 17 July 2016 at the Presidential Complex for Presidential Guard Policeman Mehmet Çetin, who had been martyred in clashes that broke out during the failed coup attempt that was staged by FETÖ/PDY (Fethullahist Terror Organization/Parallel State Structure) Terror Organization’s members within the Turkish Armed Forces. Attending the funeral were the presidential personnel as well as his family members and comrades-in-arms. Following the funeral, martyred policeman Çetin’s body was sent to his hometown Usak. At least 283 of Turkey’s Presidential Guard Regiment soldiers were taken into custody on 23 July 2016 for their alleged links to the Fetullah Terrorist Organization (FETO). Turkey on issued arrest warrants for another 300 members of the presidential guards, CNNTurk reported. Turkey's government repeatedly said the deadly coup attempt on July 15, which martyred at least 246 people and injured more than 2,100 others, was organized by followers of U.S.-based preacher Fetullah Gulen. Some of the soldiers who seized state broadcaster TRT during the attempted coup came from the presidential guard unit. 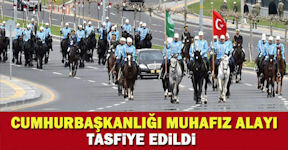 Turkey's Prime Minister Binali Yildirim said the presidential guard regiment will be abolished after some of its members are involved in the coup attempt, local media reported on 24 July 2016. "There will no longer be a presidential guard, there is no purpose, no need," he said in a televised interview with A-Haber TV. At least 283 of the presidential guard regiment members had been detained in the wake of the failed coup.